The APIH interactive video-based eLearning platform, developed by DDA with support from the CDC, trains healthcare professionals on interprofessional practices in response to public health challenges. DDA developed this interactive video-based eLearning platform for APIH in 2018. APIH is an association of four of the largest medical student associations in the United States: AACN, AAMC, APTR, and ASPPH, representing the interest hundreds of accredited U.S. and Canadian schools, and hundreds of thousands of faculty members, resident physicians, and medical students. 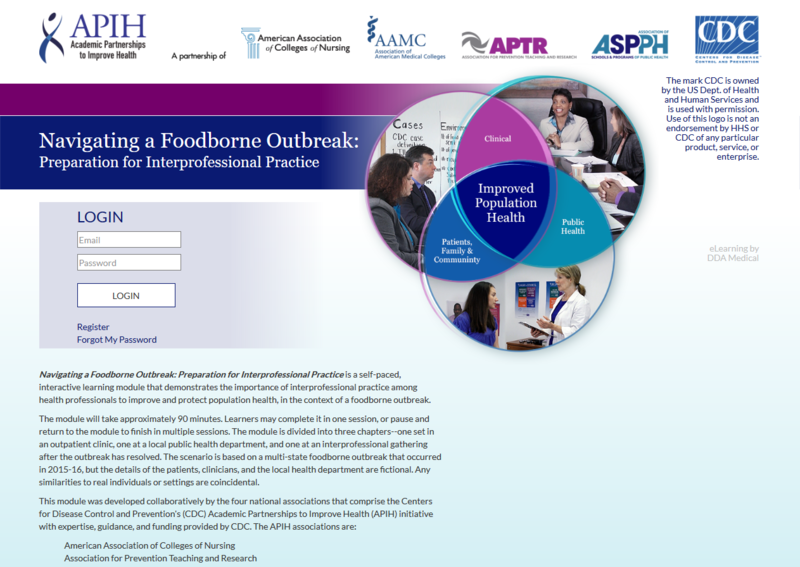 These organizations teamed up with the U.S. Centers for Disease Control and Prevention (CDC) to develop a training simulation to support professional education and workforce improvement, specifically interprofessional work across a variety of healthcare roles in addressing public health problems--in this case, a foodborne illness. They sought to create an interactive video-based eLearning platform that would demonstrate how nurses, primary care physicians, and public health officials work together using best practices to identify public health threats, determine the source, mitigate the effects on the population, and learn from the results of their responses to inform future actions. APIH delivered scripts along with informative references that would accompany the videos on the platform to give users additional explanations and insights into the topics conveyed. They also gave extensive materials for action stops which are interspersed throughout the video to give the trainee time to pause and think about a question or issue in more depth, enhancing engagement with interactivity and reinforcing key takeaway points for the learner. DDA organized all these materials and casted all nine healthcare professional roles portrayed. DDA and APIH paid careful attention to ensure a strong mix of ethnicities are portrayed to ensure that all trainees would feel represented. Over an hour of original footage was captured in four dedicated sets designed by DDA for the project at DDA’s own professional video studios. Multiple angles help keep viewers engaged and add a polished feel to the flow of visuals. The additional angles were particularly helpful in the final conference room scene when all the healthcare professionals gather together to discuss the foodborne illness outbreak and their response. These videos were then edited into dozens of clips, which are then distributed through the eLearning navigation system’s content division of chapters, scenes, and clips. Additional post-production editing allowed for the visual presentation of critical resources in the video screen as well as ensuring that the best take of each actor’s delivery was presented within each individual video clip, which sometimes required editing between multiple video recordings of the same scene. The interactive features on the eLearning platform are extensive. Users can save references and resources that are presented below the video screen, or take and save notes during the eLearning module flow for later reference. The references presented during the eLearning flow include downloadable PDFs and other documents, along with links to online resources to give greater depth to the eLearning experience. A pre-module assessment (test) is given before the video interactive eLearning content are presented to gain a reference point from trainees as to the level of expertise they have on the public health topics prior to going through the training, and a post-module evaluation assesses their knowledge after they have completed the eLearning module. After achieving a passing score on the post-module assessment, they complete a module evaluation to give APIH, its partner organizations, and the CDC insight into the relative success of the training platform. They are then awarded a personalized certificate of completion that they can print, save to their computer, and access again upon login at any time. An administrative area allows APIH to view aggregate data on trainee knowledge improvement through comparing scores to pre- and post-module assessments, and this information can be filtered by educational institution for a closer look at educational outcomes in different scholastic contexts. The platform has been warmly received by APIH, with special appreciation expressed towards DDA’s ability to deliver a highly detailed, comprehensive multimedia project on an exceptionally tight deadline. APIH is in initial pilot testing, and additional features or perhaps even whole new eLearning modules have been proposed as possibilities in the future.